Franklin Foods, Inc., corporate offices are located in Delray Beach, FL, with manufacturing facilities in Enosburg Falls, Vermont and Casa Grande, Arizona. Franklin Foods is a Safe Quality Foods (SQF) Level 3 Certified manufacturer. Franklin Foods began producing cheese in 1899 using fresh milk and cream from nearby farms. Today the Franklin Foods tradition of top quality, delicious taste and dairy innovation continues. Franklin Foods is the fastest growing cream cheese producer in the World and continues on its mission to “Re-Invent Cream Cheese for today’s consumers.” Franklin Foods’ award-winning products are distributed to industrial, institutional, foodservice, private label, supermarket and club store accounts across the United States and numerous international markets. As a full-line manufacturer Franklin Foods products consist of Cultured Cream Cheese, Cream Cheese, Bakers Cheese, Mascarpone, Flavored Dips and Spreads, Baking Cheeze Blend, Reduced Fat, Neufchatel Cheese, Whipped Cream Cheese, Organic Cream Cheese, Yogurt & Cream Cheese, and the industry’s first Greek Cream Cheese. In addition Franklin Foods offers extensive packaging capabilities in a variety of sizes: 1oz. portion cups, 8oz. bars, 8oz. cups, 3Lb bars, 5 Lb tubs and 30Lb bulk. All of our products still start with the freshest milk and ingredients, then are produced under strict Safe Quality Foods SQF 2000- Level 3 and FDA-approved HACCP guidelines, providing product safety and batch-to-batch consistency, and are kosher certified (as permitted). We provide an extensive selection of products that includes rBGH free, organic, reduced fat and more. 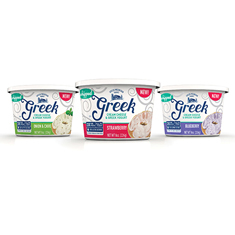 Green Mountain Farms Tzatziki Savory Yogurt Dips are a bold new take on an old world favorite. Today, Green Mountain Farms Tzatziki Savory Yogurt Dip has built upon this time-honored culinary tradition of fresh flavors and versatility by crafting a Tzatziki recipe that is perfect for adventurous American palates. The results is a whole new level of savory yogurt goodness that is perfect for serious dipping with pita chips and rich enough to be used in favorite recipes—enjoy as a topping on a grilled lamb burger!